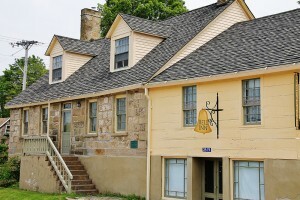 One of New Brunswick’s oldest stone houses still standing, the Bell Inn was once an inn and stagecoach stop that offered homey hospitality to weary travelers on the ‘Great Road’ between Saint John and Halifax. Its well-known restaurant is currently closed, but expected to open soon. The building is owned and maintained by the Westmorland Historical Society. For more information about The Bell Inn, read Eugene Goodrich’s article, A History of the Bell Inn. 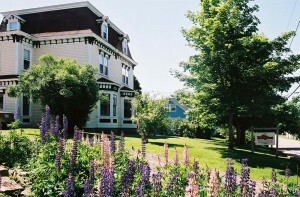 When the ‘Weldon Hotel’ was built about 1838 it was considered one of the finest in the Maritimes. Its owner was Andrew Weldon, a grandson of one of the first two Yorkshire settlers in Dorchester, and well known for his sociability. One of his boarders described him as a spare man with a long beard and “an authority on people and things hereabouts.” He was also a partner for a time in the Harvey Eastern Royal Mail Stage whose coaches stopped at the hotel for meals and a change of horses until about 1858 when another line opened in association with the Bell Inn. Like the Bell, the Weldon Hotel did not long remain in business after the arrival of the iron horse in 1868. Extensively remodeled, it turned into a general store that flourished under a succession of owners until the 1970s. After a period of dilapidation, the Westmorland Historical Society narrowly rescued it from the bulldozer, renamed it the ‘Payzant-Card Building’ in memory of the partners who ran the first general store in it, and has maintained it ever since as an apartment house and host to the Dorchester Memorial Library. For more information, read Gene Goodrich’s article on The Stagecoach Era in Dorchester. This elegant Second Empire style house, built about 1872, was once the home of Sir Pierre-Amand Landry (1846-1916), one of the most important figures in the Acadian Renaissance. The son of Amand Landry, the first Acadian member of the New Brunswick legislative assembly, Pierre-Armand was educated at both the Fredericton Collegiate School and Collège Saint Joseph in Memramcook, and was thoroughly bicultural as well as bilingual. After a stint as a schoolteacher, he studied law with Albert J. Smith and went on to achieve a whole string of Acadian ‘firsts’: the first Acadian lawyer, first Acadian cabinet minister (as Provincial Secretary after following his father’s footsteps into the provincial legislature), Member of the Canadian Parliament, County Judge, Judge of the New Brunswick Supreme Court and Chief Justice of the New Brunswick Court of King’s Bench. Shortly before his death he was knighted for his services to both linguistic communities and would very likely have been appointed Lieutenant Governor of the province, had his failing health permitted. Throughout his brilliant career, Landry was a passionate advocate of Acadian rights and culture. (He presided over the first three Acadian national conventions held in Memramcook, Miscouche, P.E.I, and Church Point, N.S., recognized ever since as the beginning of the Acadian Renaissance.) But it was always with an attitude of understanding and appreciation of Anglophone culture and achievement as well. A true Canadian, as well as a New Brunswick and Acadian patriot, he dreamed of a “truly Canadian spirit” oblivious to linguistic and religious differences. 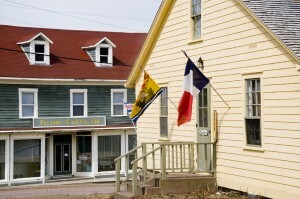 Although serving today in a more modest role as an apartment building owned and operated by the Westmorland Historical Society, the Sir Pierre-Amand Landry House deserves its recognition as a symbol of harmony and equality between Francophone and Anglophone in New Brunswick. As an additional point of architectural interest, Landry was Minister of Public Works when the New Brunswick Legislative Assembly Building was being built (it opened in 1882) and he presided over its construction. It’s no accident that, like his Dorchester home, it, too, is in the French Second Empire style—nor that the building stone came from the Dorchester quarries in his riding. While the house is a property of the Westmorland Historical Society, it is rented as a private residence and not open to the public.